Home » Babies » What Is the Apgar Test and Why Is it So Important? What Is the Apgar Test and Why Is it So Important? When she is giving birth, the only thing a mother wants is to be able to have her child in her arms. After 9 months of waiting and suspense, the first thing you ask the doctors is if the baby is healthy. To eliminate possible concerns, minutes after childbirth, the newborn is usually examined and subjected to the so-called Apgar test. The medical staff carries out this thorough evaluation in which a series of assessments are made to rule out possible health problems in the newborn. This checkup is completely routine and normal: it does not cause any problems for the baby, and it is performed the same way for every baby. The first ten minutes of the baby’s life are critical. Therefore, physicians immediately perform the Apgar test, a quick examination of the newborn’s state of health. It is usually carried out right after childbirth, then again after five minutes, and sometimes again after ten minutes. The process evaluates five criteria, in which each factor is scored from 0 to 2, and they are all added up to create the overall score. The initial Apgar test is used to find out how the baby has tolerated the birthing process. The second test, on the other hand, shows how the baby has adapted to life outside of the uterus. The last is considered the most significant. 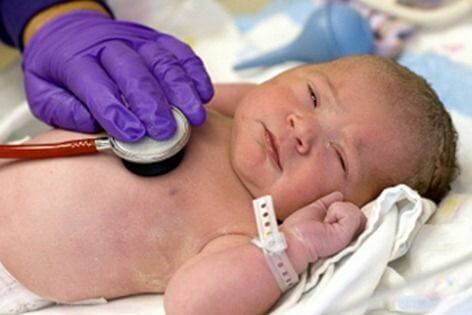 The examination is a fundamental tool in the field of neonatology. This test is primarily used to determine, quickly and in a non-invasive way, if the newborn needs respiratory aid, has heart problems, or has neurological sequelae. If the baby scores between 7 and 10, it means the baby has successfully gone through the adaptation process. If the results are between 5 and 7, the child has suffered from oxygen deficiency during childbirth. In that case, a source of oxygen should be applied. Very few babies score less than 5. Usually, this only occurs with premature or emergency cesarean-births. There is also a risk that they have experienced difficulties in childbirth, or the possibility of breathing or cardiac problems. Heart rate. According to pediatricians, this is the most important criteria that is assessed with the Apgar test. If the child does not have a heart beat, it is scored a 0; if it is less than 100 beats per minute, it is scored 1; and if it exceeds 100 within the time period of the test, the score is 2. The respiratory effort is used to gauge the maturity and health of the lungs. To do this, the chest movements are carefully observed while the baby inhales and exhales. When the child is not breathing, they are scored a 0; if their breathing is slow or irregular, they are given 1 point; and if they are breathing properly or crying, they score 2 points. Muscle tone. This is the strength of the newborn’s movements and the bending of their extremities. A baby has a good muscle tone when they can flex their extremities and move actively, with a score of 2. Poor muscle tone is when their limbs are outstretched and limp, the score of which will be 0. 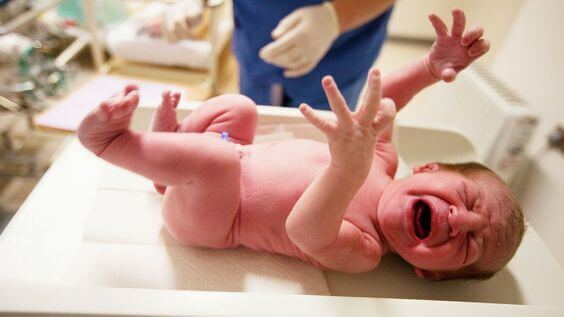 This is the newborn’s involuntary reaction to certain relatively irritating external stimuli. Mainly, signs of irritability (crying, grimacing, coughing, sneezing or kicking) are assessed. A lack of response is scored 0; if grimaces and slight gestures are present, the score is 1. If the baby is crying, coughing or sneezing, they score a 2. Skin color. This criterion has to do with the degree of the baby‘s oxygenation and varies according to the child’s pigmentation. In black children, medical professionals look at the color of the mucous membranes of their mouths, cornea, lips, palms of the hands, and the soles of their feet. If the baby is white, they look at the appearance of their skin in general and compare it to that of their feet and hands. During each Apgar test, the pediatrician scores a number of criteria. Each one is given a score between 0 and 2. The final score provides a first insight into the health of the newborn, and which aspects should be paid special attention to in order for them to lead a healthy life or, a life with the fewest health difficulties possible.